Core from the Uteland Butte Member of the Green River Formation, Uinta Basin, Utah (Bill Barrett Corp., 14-1-46). One of the productive horizontal targets is the roughly 5-foot-thick tan dolomitic bed with porosities ranging from 20 to 30%. The oil is sourced from the surrounding darker gray organic-rich limestones, which contain abundant shell fossils, indicating that these layers were deposited in a freshwater lake. The National Energy Technology Laboratory, part of the U.S. Department of Energy, recently funded the Utah Geological Survey to analyze and characterize the potential of Utah’s shale formations for liquid hydrocarbon production. In particular, this new three-year study will research organic-rich units within the Green River Formation of the Uinta Basin in northeastern Utah and the Paradox Formation of the Paradox Basin in south-eastern Utah. The current high price of crude oil, coupled with lower natural gas prices, has generated renewed interest in exploration and development of liquid hydrocarbon reserves. Following the success of the recent shale gas boom (e.g., Barrnett shale in Texas, Woodford shale in Oklahoma, Marcellus shale in Pennsylvania and surrounding states) and employing many of the same well completion techniques (e.g., horizontal drilling and hydraulic fracturing), petroleum companies are now exploring for liquid petroleum in shale formations (e.g., Bakken shale in North Dakota, Eagle Ford shale in Texas). In fact, many shales targeted for natural gas also include areas in which the shale is more prone to liquid production. In Utah, organic-rich shales in the Uinta and Paradox Basins have been the source of significant hydrocarbon generation; companies have traditionally targeted the interbedded porous sands or carbonates with conventional recovery techniques (e.g., vertical or near-vertical wells). However, with the advances in horizontal drilling and hydraulic fracturing, operators in these basins are now starting to explore the potential of the shale units themselves. The Green River Formation in the Uinta Basin has been studied for over 50 years since the first hydrocarbon discoveries. However, early studies focused on the many conventional sandstone reservoirs currently producing large quantities of oil and gas. In contrast, little information exists on the more unconventional crude oil production potential of thinner, organic-rich shale/carbonate units such as the Uteland Butte member, black shale facies, and deep Mahogany zone. 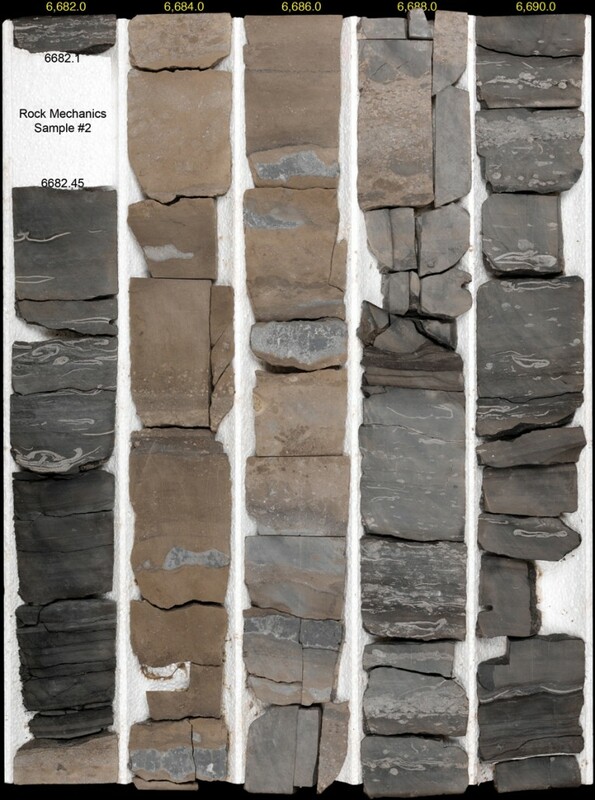 For information on the distinction between shale oil and oil shale, which also occurs in the Green River Formation, see article by Thomas Chidsey, Survey Notes, September 2012, v. 44, no. 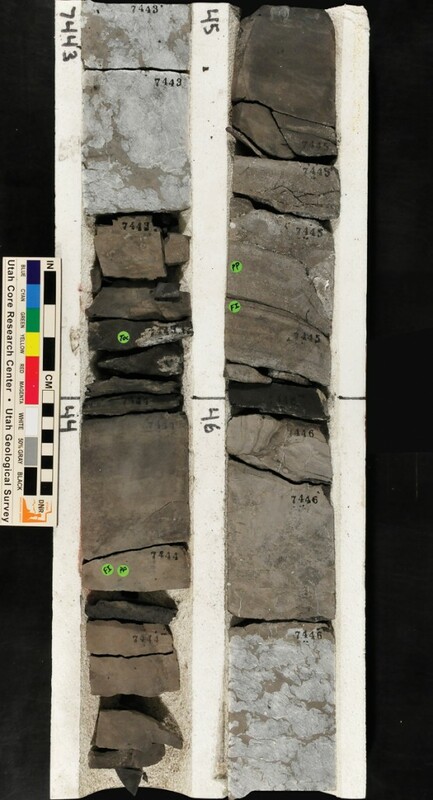 3 (in short, oil shale refers to rock that contains immature organic material called kerogen, while shale oil has experienced sufficient heat/pressure, converting organic matter into crude oil, which is still trapped in the micro-pores of the shale). The Paradox Formation in the Paradox Basin consists of multiple layers of salt interbedded with clastic deposits (sands, silts, clays, or carbonates), many of which contain organic-rich shales. 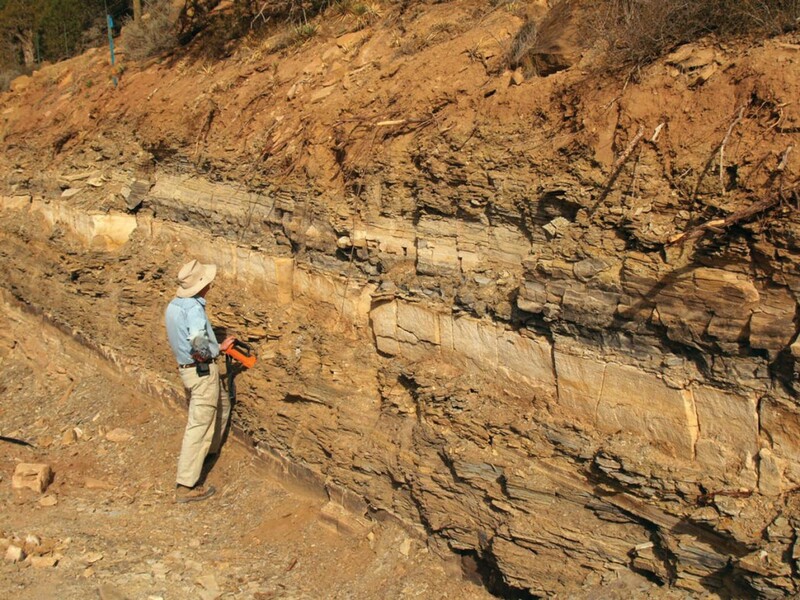 One such clastic interval, the Cane Creek shale, has been a target for exploration on and off since the 1960s and produces oil from several small fields. The play generated much interest in the early 1990s with successful use of horizontal drilling in a handful of wells. Despite this limited success, little research has been conducted or published to further define the play and its reservoir characteristics. Over the next three years, the UGS plans to characterize the geology of these prospective shale formations to better predict the areas, or “sweet spots,” with the greatest production potential. In addition, our research partners at the Energy and Geoscience Institute at the University of Utah will investigate the geomechanical properties (rock strength, brittleness, elasticity, etc.) of these rocks to help determine the best drilling and well completion strategies. A more complete understanding of the geology and geomechanical properties of these formations will help maximize potential recoverable reserves and limit the drilling of nonproductive wells, which in turn will help reduce environmental impacts.